Our handsome hero wins the hand in marriage of a petulant Princess. But that’s not the only story. There’s a lot else to thrill and bamboozle as unhinged shenanigans abound featuring preening Pusses, odious Ogres, Dames in distress, morose Monarchs, wily Wizards, flatulent Fairies and much more. All proceeds from this rambunctious production go to local causes – Telegraph Hill Centre and Bold Vision. 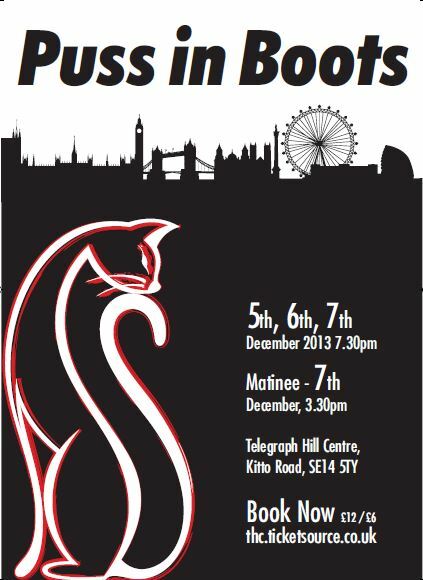 Puss in Boots plays from 5 – 7 December, with two shows on Saturday 7 December at 3.30 and 7.30pm. Tickets are £12 / £6 (children aged 3 and under go free). There will be tea, cakes and a bar too, so come on down. This year’s cast features faces familiar and new drawn from across the borough. What’s certain is that you won’t have seen them like this, ever! With a plethora of songs, passion, pathos and good old fashioned thigh slapping Panto polish, this production will leave you breathless with laughter and joy. Everyone from cast and crew to production have given of their time and talents generously and free of charge. We do it because we value our community. Support us, come and see the show!